I understood that an unknown author might not quickly pick up new fans, but I couldn’t imagine that everyone I knew hadn’t rushed online to buy a copy within days of hearing the news that the book was available. After all, that was one of the most exciting days of my life. Perhaps, however, I was being unrealistic. Not everyone would make it a priority to purchase immediately. They had their own lives after all and their own priorities. The arrival of my yearly royalty statement the following January added the death knell to my expectations. 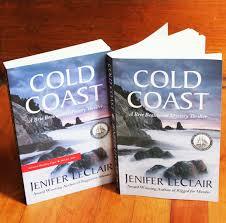 No best seller list for me and my brilliant suspense novel. Despite the 4- and 5-star reviews, it was not yet time to quit the day job and buy a writer’s cottage along the Oregon coast. Even if every person I knew had gone out and bought a copy of the book, it was clear now that word of my Great American Novel had not spread far. My friends and family had not praised the work to everyone they knew, had possibly not even mentioned it once in passing to another human being. With my second book released and 10,000 words written on the third, I have learned a lot about writing and promoting. Mainly that mixing the two often produces an oily sheen on the clear-flowing waters of creativity. Stirring promotional expectations into relationships muddies the waters even further. Marketing is your responsibility and that of any professional whose job it is to do so: your publisher, your agent, publicists you hire, and writers organizations you join. It is not the concern of people who know you. Stop expecting them to promote the book. Stop expecting them, even, to buy the book. Their job is to pick up the tab at lunch once in a while, send you birthday cards, and make you laugh when you just feel like crying. However, when appropriate—if they ask, if the opportunity arises and the person seems open to it—don’t be afraid to suggest (key note here: suggest implies using a friendly, undemanding, and non-bitter tone) specific ways they can help you spread the word. Paint the cover of my novel on the side of your house and rent one of those flashing neon arrows to point to it. Okay, maybe not that last one. Unless they really, really want to. Regardless of how much they spread the word, or don’t, it is important for me to remember the one support they have always provided and still do: accept me as the weird, quirky, anti-social writer that I am so that I will continue to sit at the keyboard and put down one word after the other after the other. For that at least, they deserve a mention in my Pulitzer prize acceptance speech. Snow Ramirez hasn’t trusted anyone in a very long time, not even herself. Memories of her childhood on Washington’s Yakama Reservation haunt her even on the streets of Chicago. When her squat mate Blitz slits his own throat in front of her, she knows it’s time to convince someone to trust her instincts. Normally she wouldn’t care. Who wasn’t crazy in one way or another in this messed up world? Snow’s little brother Alley, though, there might still be time to save him. If only she can get reporter Jo Sullivan to believe her story before Snow loses her own mind. 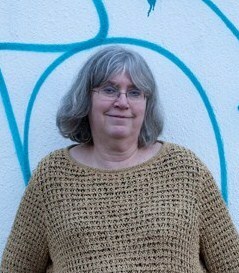 Debra R. Borys released her first novel, Painted Black, in 2012. 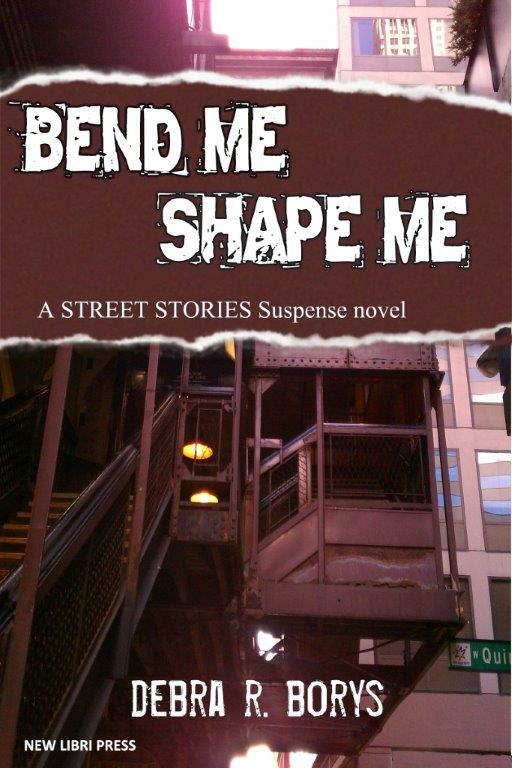 The Street Stories series combines the gritty reality of homeless life on the Chicago streets with bizarre and quirky suspense plots. Debra uses her personal experiences from years of volunteering with service agencies in both Chicago and Seattle to bring the characters and streets to life in these fast-paced, gripping tales. 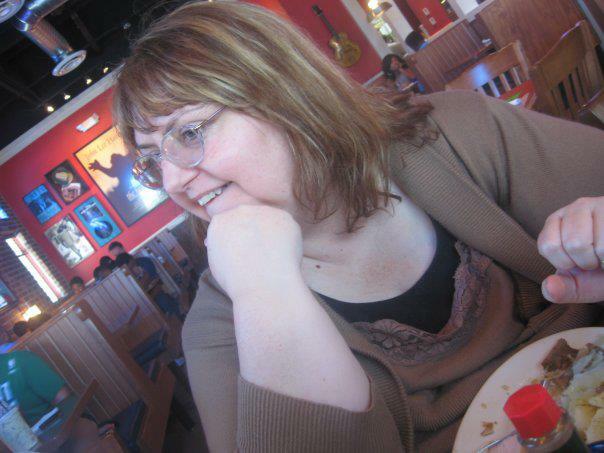 She currently works as a freelance writer and editor and is working on a third Street Stories novel. More info can be found on her websites www.Debra-R-Borys.com and www.StreetStoriesSuspenseNovels.com or on Facebook http://www.facebook.com/deb.borys and Twitter @debborys. Let me introduce myself. My name is Rochester and I am a Golden Retriever. For those of you who read about me in the book In Dog We Trust, it is good to see you again. For those new to Golden Retriever Mysteries, Welcome! For a little background, I now share a townhouse with Steve Levitan. We enjoy each other’s company and share some wonderful times as well as a few scary adventures. Steve has a full time job as an adjunct in the English Department of Eastern College, his alma mater. Having a full time job is something new for Steve and me. Steve got into a little trouble prior to moving here and it has been a struggle to put the past behind him but things seem to be coming together now. Steve is currently working under Mike MacCormac, the director of alumni relations and Eastern is getting ready to launch a $500 million capital campaign to fund new constructions, scholarships and faculty chairs. Mike isn’t happy with Joe Dagorian, director of admissions. Mike has a wealthy alumni targeted for a major gift but Joe is refusing to send an admittance letter to Moran’s son. The night of the big fund-raiser finally arrives and Steve is busy at the party. I am resting in Steve’s office when I decide to go wander around outside and that is when I find Joe’s body. I immediately notify Steve, the police are called and the investigation begins. Joe thought the money being spent for the party was a waste and could be used to better advantage in other areas. There were several people at the party who had reason to be happy to be rid of Joe so there was no lack of suspects. Joe was Steve’s mentor and his friend and Steve was determined to do everything he could to bring the killer to justice. I was able to be quite a bit of help when I uncovered a few clues and pointed them out to Steve. Joe’s murder was not the only mystery that was solved in this story. 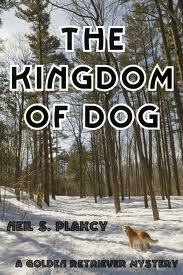 I think you will like the characters in The Kingdom of Dog and find the story to be a real page-turner. If you haven’t read In Dog We Trust, try it too. One of the things I come across most consistently in my day-to-day work with authors is unrealistic expectations. Sometimes it’s experienced authors who just don’t realize how much the publishing industry has changed in the last several years; other times, it’s newer authors who believe the myths and hope for the best. Still, unrealistic expectations can be a source of heartache and certainly can make it hard to set and achieve realistic goals for promotion that increases sales. Beware! National media is a long shot. When you look at the big picture, there are a very few spots available and a huge number of potential guests want them. Journalists who do the guest scheduling are known for saying things like, “We don’t do fiction,” and while that’s obviously not entirely true, it should be a clue. Producers aren’t looking for ways to sell your book, they’re looking for ways to engage their audiences and attract advertisers to keep them in production. Even if I can find a segment idea to pitch them about why you will be the perfect guest for their program, I still have to have clips and references from other shows you’ve been on to convince them that you’re a seasoned professional and won’t leave them looking like an idiot. Most authors who are insistent about national media seem to want to bypass those things and rarely have significant clips, experience or program hooks for me to use. I’m not saying it can’t be done, it can and I’ve done it. I’m just saying it’s a long shot so wisdom says to make it part of your publicity plan if you like, but don’t put all your eggs in that basket. Overnight success isn’t likely. Ours is a “microwave” society. We want instant gratification and have set out to discover ways to shorten the process, whether it’s cooking a baked potato or developing name recognition and demand for a brand. I get quite a few requests for media tours that take place over one and two week periods and reviews that are complete in a matter of weeks. What I seem to have trouble communicating is that I can make those things happen, with some effort, but they won’t accomplish what many authors hope they will and that’s to make them a household name in a few weeks. It just doesn’t work that way. Effective, long-lasting book promotion takes time, consistency, and effort. Whatever it may look like from the outside, slow and steady wins the race. Social media is all you need these days. Wouldn’t that be great? Internet World Statistics published in 2012 show that the North American population makes up 11.4% of world internet users. Mind-boggling, right? Those of us who immersed ourselves in this new technology as soon as it became available find it hard to believe, but the numbers are pretty consistent and probably quite accurate. That translates into approximately 274 million North American internet users in 2012 so obviously authors who restrict their promotional efforts to internet users still have a large target market to work with. BUT it also means there’s a large target market they won’t reach if they don’t seek promotional opportunities offline. To get the best return on investment, it’s important to devise a well-rounded plan that targets several different areas for maximum effect. A publicist makes all the difference. I wish it was that easy. A publicist can make it easier by staffing your weakness, but even the best publicist can’t get it done if the book and the author are not suited for the pitch. Yes, I have some contacts who will book any author I call them about if I press the issue, but I don’t work like that and it wouldn’t accomplish much for you if I did. A publicist, an author and a publisher joined together can make a great team and a team can accomplish a lot more than a single author who also needs time to keep writing. There are many benefits to hiring a publicist, but please don’t think you can hire a publicist then go back to writing and forget promotion. A publicist alone won’t take you where you want to go. I believe the potential for authors is HUGE in 2014. Opportunities abound and I hope you have a plan to take advantage of them. There’s no better time than the present! So adjust your expectations and get started (if you haven’t already). If you need another member of your team, or if you just have questions, feel free to contact me at BreakThrough Promotions. Onward we go! Brie Beaumont is a homicide detective on leave from the Minneapolis Police Department and decided to take a cruise aboard The Maine Wind, an old-fashioned sailing ship. The ship is owned by Captain John deLuc. When an incident left Captain deLuc’s crew short one person he asked Brie to be second mate and she accepted. Brie and John have become close during their time together on the ship and it is now nearing the time for Brie to decide if she is going to return to Minneapolis and her duties as a detective. The Maine Wind docks at Tucker Harbor, Maine after a storm. Tucker Harbor is a small lobster fishing village. Brie and another crew member decided to take the longboat ashore and several passengers expressed interest in going ashore and hiking along a trail that led to the village. The group set out on the trail but suddenly Brie heard a terrified cry from Hurley, one of the ship’s passengers, that was followed by one from another passenger. The group had come across a body on the trail. It turned out that the body was that of Jake Maloney, one of the residents of Tucker Harbor. The police were summoned and Dent Fenton of the Maine State Police started the investigation. When he realized Brie was an experienced detective he asked that she assist him in the investigation. Brie agreed to help and soon found that another murder had occurred earlier in the village. This is the third Windjammer book with Brie Beaumont. It seems wherever The Maine Wind takes her Brie winds up in the midst of a mystery. Previous books are Danger Sector and Rigged for Murder. It is not necessary to read the books in order but they are all full of wonderful descriptions of life on a sailing vessel and the mysteries are tense and keep the reader guessing until the final outcome. We’ve all been there—the book signing from hell. You sit at a table, maybe by the door of the store, behind a stack of books and smile at people as they go by. Most try to avoid looking you in the eye. A few smile, and some even stop to pick up your book, flip it over and read the back copy, then smile again and put it down, perhaps with a polite, “Maybe after I browse.” In two hours, you’re lucky if you sell two books, and then the store manager comes with six or eight books for you to sign and leave behind. And that’s it. Maybe you’ve driven thirty miles to get to this event, bought a new outfit, had your hair done. You may well be out much more than you earned. I remember some wretched book signings all too well. At one a friend and I who both wrote about the American West were seated with a gentleman who wrote traditional westerns and dressed the part—boots, jeans, and a big hat. If someone walked by in jeans, he’d call out, “Hey, you look like you like westerns. Let me show you these books.” My friend and I wanted to sink under the table. A few experiences like that are enough to make you swear off book signings. Indeed in this age of social media, maybe book signings are obsolete. Maybe you should concentrate on the various lists on the net, blogging, guest blogging, and the like. 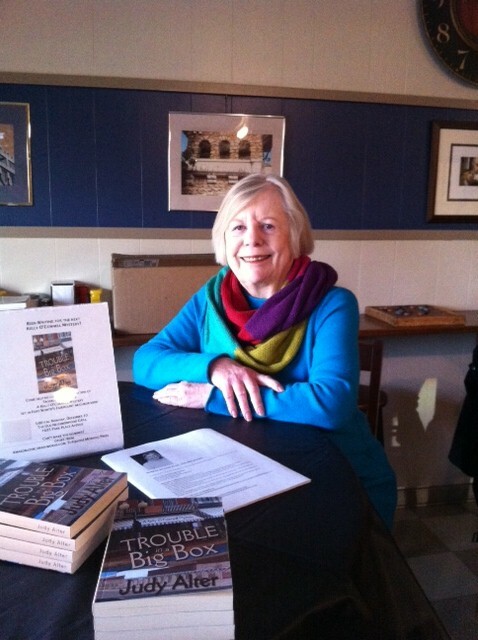 For my first mystery, I sold 75 books over a two-day signing—but it was a little different. It wasn’t in a bookstore but in a café called The Old Neighborhood Grill, mentioned often in the novel. The owner reserved a table by the door for me and had flyers on hand beforehand. I sent out a newsletter to my mailing list (considerably shorter then) and announced the event on Facebook and Twitter. I put flyers in a few select places but not many stores are willing to give up counter space. I did purchase some plastic frames that you slip a flyer into and put them around, for instance in the local hardware nearby (not a chain but a wonderful eccentric place catering to the needs of owners of old homes—the novel had a lot about Craftsman houses and historic residential districts in it). At the signings, I had book marks and more flyers in those plastic stand-alone frames. I signed from 7 a.m. until 9 a.m. on a Saturday morning, because the owner said that was when the readers came in. Friends actually came to have breakfast and buy books. It was fun and a huge success. Then I signed again from 5 p.m. to 7 p.m. the following Monday night. Friends came to chat and have a glass of wine. 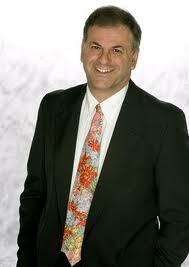 I did not provide food or wine for either event, which was a huge help to my bottom line, and nobody seemed to mind. Many were Grill regulars, and they expected to pay for their food. The events also brought new people to the Grill and a steady stream of customers, so the owner was pleased to provide the space at no charge. Subsequent signings have been good but not that good. I scheduled one for a night when the weather turned bitter, and the increasing sale of ebooks has cut into the signing party market. Unfortunately for some time there’s been a gap of six months or more between ebook and print publication (my publisher promises to remedy that in the year to come). But I remain optimistic about signing parties that move out of the bookstore box. Even if you don’ t sell many books, you draw attention to your work. And you can have a great time! When free-lance journalist Sara Jo Cavanaugh comes to Wheeler to do an in-depth study of Kate’s town for a feature on small-town America, Kate senses she will be trouble. Sara Jo stays at the B&B, Tremont House, run by Kate’s sister, Donna, and unwittingly drives a further wedge into Donna’s marriage to Wheeler’s mayor Tom Bryson. And soon she’s spending way too much time interviewing high school students, one young athlete in particular. Police chief Rick Samuels ignores Kate’s instinct, but lawyer David Clinkscales, her former boss from Dallas, takes it more seriously. There’s a love triangle, a cooking school, a kidnapping, a broken marriage, and a lot of adventure before the threads of this mystery are untangled, and Wheeler can go back to being a peaceful small town. If it ever does. 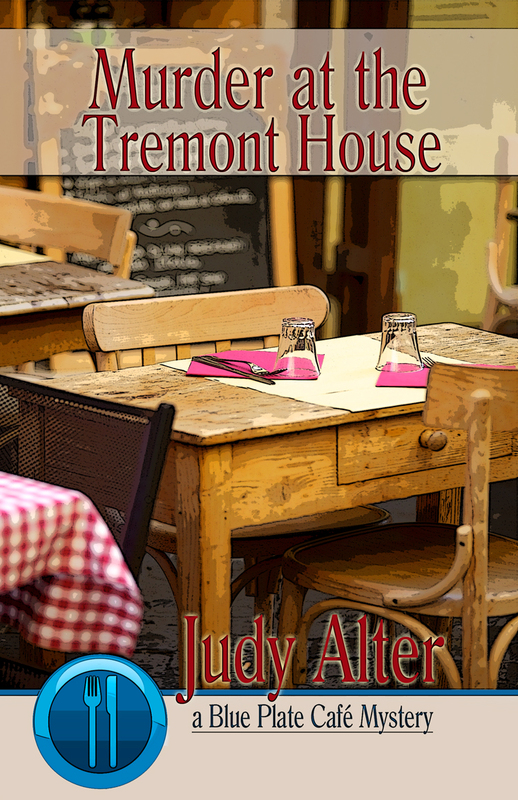 Murder at Tremont House is the second Blue Plate Mystery from award-winning novelist Judy Alter, following the successful Murder at the Blue Plate Café. Judy is also the author of four books in the Kelly O’Connell Mysteries series: Skeleton in a Dead Space, No Neighborhood for Old Women, Trouble in a Big Box, and Danger Comes Home. With the Blue Plate Murder series, she moves from inner city Fort Worth to small-town East Texas to create a new set of characters in a setting modeled after a restaurant that was for years one of her family’s favorites.